The day I saw that Tilly and The Buttons had released a pinafore dress pattern was a great day for me. 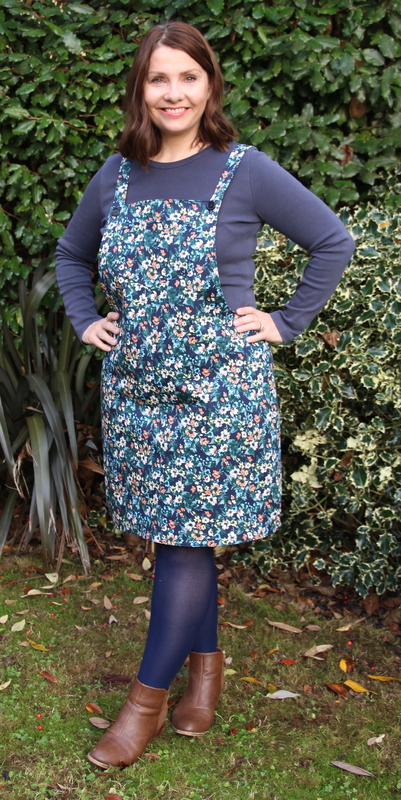 I had been trawling the internet for a decent pinafore pattern for a very long time and whilst I could find patterns with bibs and ‘skater’ style skirts I couldn’t find any with this all in one style with no waist seam. This was perfect! Last Winter I had admired a couple of patterned pinafores I had seen in the shops and this was what I wanted my Cleo to look like. I was very excited to read that Tilly and the gang were going to be hosting a Cleo sewing party on November 26th, where you could share your progress on Instagram. Do check out the hashtag #sewingcleo for tons of inspiration. I very much wanted to be a part of this so the pattern was promptly ordered and whilst I waited for this to arrive I searched for my perfect patterned Cleo fabric. I ordered a gorgeous cotton drill from eBay – bit of a risk but it was just right. The only other supplies I needed to buy were a couple of buttons as I already had black thread, interfacing and some leftover lining fabric. I chose to make the mini length version of the dress, which was perfect for my 5’2″ height. There is a knee length version with a front split if you prefer it longer. I also only cut and used the top pocket as I decided the hip pockets would not be flattering on my shape. I decided to use buttons as the fastenings, as I thought using dungaree buckles would be too tricky – I am really happy with the button finish but have seen so many versions online made with the buckles that next time I will definitely be giving them a go. They can’t be that difficult can they? As always the instruction booklet is superb. Great step-by-step photos and written instructions guide you through this project easily and it sews up in very little time – it would have been even quicker if I hadn’t chosen to line it. It’s a perfect pattern for any skill level. I must admit I prefer to cut out my pattern the day before sewing but on this occasion I wanted to do it all in one day. I was concerned that the weight of the fabric would make the pocket too bulky to lie flat but this was not a problem and I enjoyed the placement of it and the topstitching. I love a bit of topstitching! I chose to line the dress with some pretty emerald green lining as I know this will always be worn with tights, and I hate it when dresses and skirts ride up over tights. It was simple enough to do I just cut the lining with the front and back dress pattern pieces and lay it on top of the dress pieces and tacked them into place. Easy. It was such fun to be a part of the Tilly community for the day, I am thrilled with how the pattern came out – I may cut it a size smaller next time. 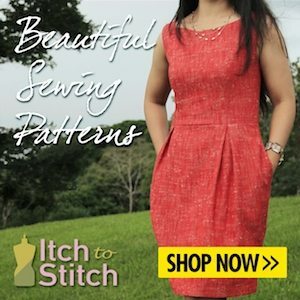 If you love Tilly and The Buttons patterns too you may like to check out my Bettine pattern review on the blog. I am also currently just finishing my first Coco dress and of course that pattern review will be on the blog too very soon. Have you enjoyed making a Cleo? Did you take part in the Cleo sewing party too? As always I love to hear from you. This is really cute! I love your fabric choice. I’m on the fence about this pattern– I want to make it but I’m worried about fit. You’re convincing me though!